How harmful is secondhand smoke? Nonsmokers' risk of heart attack goes up 25 to 30 percent if they inhale it. The ban on smoking in public places, such as bars and restaurants, has been one of the greatest public health debates of the early 21st century. Now, two large studies suggest that communities that pass laws to curb secondhand smoke get a big payoff -- a drop in heart attacks. Overall, American, Canadian, and European cities that have implemented smoking bans had an average of 17 percent fewer heart attacks in the first year, compared with communities who had not taken such measures. Then, each year after implementing smoking bans (at least for the first three years, the longest period studied), smoke-free communities have an average 26 percent decline in heart attacks, compared with those areas that still allow smokers to light up in public places. The new studies should grab the attention of cities as well as states that still permit smoking in (at least certain sections of) bars, casinos, restaurants, and other public places. Overall, 32 states and many cities in the United States have passed some type of law prohibiting smoking in public spots. (You can check out the American Nonsmokers' Rights Foundation to find out if your local community has a ban.) In addition, England, France, Ireland, Italy, Norway, and Scotland have passed such bans. In 2005, there were 1.26 million heart attacks in the U.S., and about 445,687 of those people died, according to the American Heart Association. The new research suggests that a nationwide ban on smoking in public and workplaces could prevent 100,000 to 225,000 heart attacks each year in the U.S., says one study author, Dr. David Meyers,of the University of Kansas School of Medicine. How harmful is secondhand smoke? Nonsmokers have a 25 percent to 30 percent higher risk of heart attack if they inhale smoke at home or at work, and smoke has been shown to affect heart health within minutes, says Meyers. "We know that if you expose somebody, it's bad," says Meyers. "How about if you ban the exposure -- will that make any difference? So that end of the logic had to be looked at, and now we can say, absolutely." "This is only the short-term result; lung cancer takes a lot longer to show up," says Dr. Steven A. Schroeder, the director of the Smoking Cessation Leadership Center at the University of California, San Francisco. In the first study, James Lightwood, Ph.D., and Stanton Glantz, Ph.D., both of the University of California, San Francisco, analyzed data from 13 studies conducted in five countries. They found at least a 15 percent decline in heart-attack hospitalizations in the first year after smoke-free legislation was passed, and 36 percent after three years. The National Cancer Institute funded the study. Overall, women, nonsmokers, and people under age 60 seem to benefit the most in regard to heart-attack-risk reduction, Meyers says. Many of those affected are employees in places where smoking is still allowed, he says. "I feel very sorry for the hospitality and entertainment industry workers, because that's exactly who those folks are," Meyers explains. "They are really getting exposed." 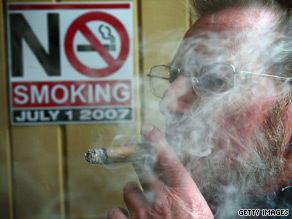 Opponents have argued that smoking bans drive away customers. Study results have been mixed, with most indicating that the impact on bars and restaurants is neutral or may actually improve business, says Schroeder. However, some businesses, particularly casinos, are still concerned that smoking bans may cause their customers to choose locations that will allow them to light up freely. "The New Jersey state legislature recently revoked a ban because business was down in casinos -- but business is down everywhere," Schroeder says. Such arguments suggest that a nationwide ban on smoking in public places and workplaces -- similar to those enacted in countries like France and Italy -- could help level the playing field, says Meyers. "I used to fly on airplanes where anyone could smoke, then it was only certain sections, says Schroeder. Now if smokers were allowed to light up on a plane, "people would be shocked," says Schroeder. "Certainly airplane travel hasn't decreased; this is the same type of situation."